All the transport systems are both varied and cheap, if a little confusing for the first time visitor. Traffic jams are the main problem, so planning ahead is essential for finding your way around. 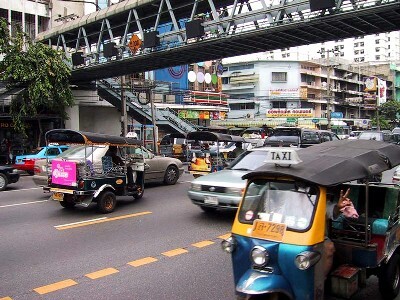 The city's transport falls into two categories - sophisticated: taxis; Metro; and BTS/SkyTrain; and basic: tuk tuks; buses; riverboats; and motorbike taxis. 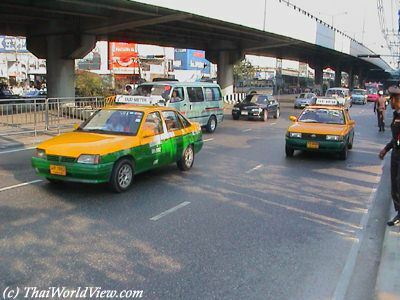 Bangkok has plenty of brightly coloured, air-conditioned metered taxis. A fare from between 60-100 baht will get you a long way in Bangkok. The drivers are reliable and most speak English. You will have to flag one down, no taxi ranks here, but you can always find plenty of taxis plying their trade across the city. Bangkok's Metro was launched in 2004. The fares range from 15 to 39 baht. There are stations close to Bangkok's main tourist draw, Patpong, and Sukhumvit Road, another major nightlife area. It is air-conditioned, and can provide some relaxation from the heat above. Useful stops are at Hua Lamphong for Bangkok's main overland train station, and Chatuchak Park, near to the northern bus station at Mo Chit and the famous Chatuchak weekend market - a must see for any Bangkok tourist. 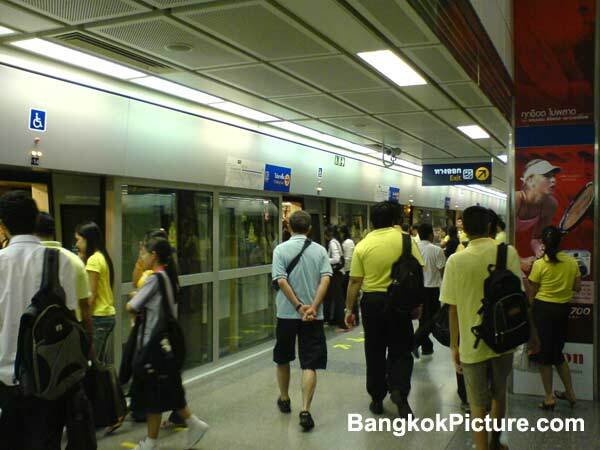 Bangkok's BTS/SkyTrain system, opened in 1999, has 2 lines and covers more of the city than the Metro. 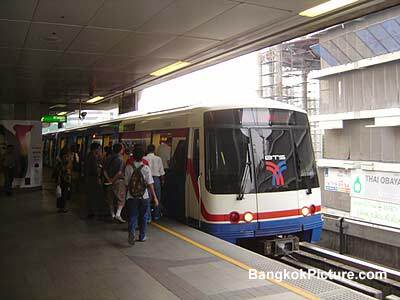 There are stations close by many of Bangkok's main tourist venues. It links with the Metro at certain points, so can be useful for sightseeing trips. The trains are fully air-conditioned. Fares range from 15 to 40 baht. Useful stops include Siam for Bangkok's luxury shopping mall, Siam Paragon, Sala Daeng for Patpong, Ekkamai for the eastern bus station that serves Pattaya, the popular coastal resort, and Mo Chit for Chatuchak market. Bangkok's tuk tuks operate all over town. A ride in one is a must do for any tourist. Fares have to be negotiated, so haggling is inevitable. During rush hours they might be a little faster than a taxi. Beware of drivers offering city tours for 20 baht, they might lead you into a scam. 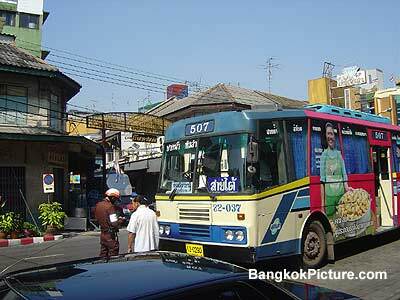 Bangkok's public buses are numerous and cover the whole city. They are a mixture of fan only and air-con buses. Some have their stops printed on the side in English. Bangkok's new airport, Suvarnabhumi, has a bus service that ferries passengers to and from the city's downtown area. If you want to venture out of town, Bangkok has three bus stations: southern at Pin Klao for Phuket; northern at Mo Chit for Ayutthaya or Chiang Mai; and the eastern at Ekkamai on Sukhumvit Road. Bangkok's riverboats provide an opportunity for a trip on the city's Chao Phraya River. Sathan Taksin Pier, close to the BTS/SkyTrain of the same name, is a good place to pick up a boat. 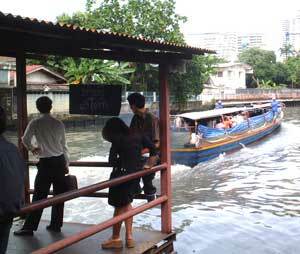 One recommended trip is from Tha Chang pier, where a boat will take you on a tour of the Thonburi canals. These are for the more adventurous traveler. The taxi bike drivers wear orange vests and work from street corners. They are mainly used by locals and savvy ex-pats for shorter trips across town. A trip on one is not for the faint-hearted, however. 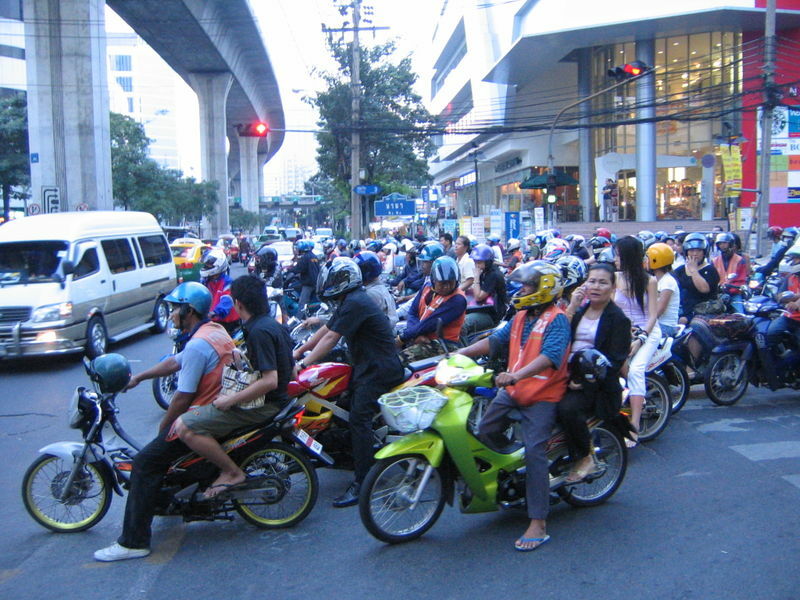 The drivers cut through Bangkok's traffic at high speed. If you need any further advice about Bangkok's transport systems, or help with planning your holiday itineraries whilst in town please contact us for more information.